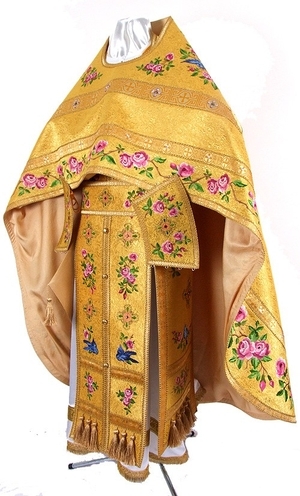 Russian priest vestments 42-44"/5'5"-5'8" (54-56/168-172) #393 embroidered - Istok Church Supplies Corp. Brand new embroidered Russian priest vestments. Solid metallic brocade, embroidered crosses and design. This set invludes 6 items: belt, cuffs, phelonion, epitrakhilion, palitsa, zone.